The Calumet River is a system of heavily industrialized rivers and canals in the region between the neighborhood of South Chicago in Chicago, Illinois, and the city of Gary, Indiana. Historically, the Little Calumet River and the Grand Calumet River were one, the former flowing west from Indiana into Illinois, then turning back east to its mouth at Lake Michigan at Marquette Park in Gary. The Chicago Sanitary and Ship Canal, historically known as the Chicago Drainage Canal, is a 28-mile-long (45 km) canal system that connects the Chicago River to the Des Plaines River. It reverses the direction of the Main Stem and the South Branch of the Chicago River, which now flows out of Lake Michigan rather than into it. The related Calumet-Saganashkee Channel does the same for the Calumet River a short distance to the south, joining the Chicago canal about half way along its route to the Des Plaines. The two provide the only navigation for ships between the Great Lakes Waterway and the Mississippi River system. The Jardine Water Purification Plant, formerly the Central District Filtration Plant, is the largest capacity water filtration plant in the world, located at 1000 East Ohio Street, north of Navy Pier in Chicago, Illinois. It draws raw water from two of the city's water cribs far offshore in Lake Michigan and supplies 2/3 of water per day to consumers in the Chicagoland Area, the Sawyer Water Purification Plant Supplies the other 1/3. Constructed in the 1960s, it began functioning in 1968. The plant was renamed after James W. Jardine, a 42-year city employee, who served as water commissioner from 1953 until his retirement in 1973. Shortly thereafter the Ohio Street Beach was formed in the bay created by the plant. Landscaping around the plant and in the adjoining Milton Olive Park was designed by Dan Kiley, and a statue, Hymn to Water, by Milton Horn graces the front entrance. The southern portion of the city is served by a separate plant, the Sawyer Water Purification Plant. Together the two plants supply water to about 3 million residents in the city and 118 suburbs. The Port of Chicago consists of several major port facilities within the city of Chicago, Illinois operated by the Illinois International Port District. The central element of the Port District, Calumet Harbor, is maintained by the U.S. Army Corps of Engineers. The Indiana Harbor and Ship Canal is an artificial waterway on the southwest shore of Lake Michigan, in East Chicago, Indiana, which connects the Grand Calumet River to Lake Michigan. It consists of two branch canals, the 1.25 mile (2 km) Lake George Branch and the 2 mile (3 km) long Grand Calumet River Branch which join to form the main Indiana Harbor Canal. Jones Island is an industrialized peninsula in Milwaukee, Wisconsin. It began as a marsh island between the Milwaukee and Kinnickinnic rivers, and now forms the city's inner harbor design. The Calumet Region is the geographic area drained by the Grand Calumet River and the Little Calumet River of northeastern Illinois and northwestern Indiana in the United States. It is part of the Great Lakes Basin, which eventually reaches the Atlantic Ocean. It is a sub-region of the greater Northwest Indiana region and the even larger Great Lakes region. The Port of Indiana-Burns Harbor is an industrial area, founded in 1965 and located on the Lake Michigan shore of Indiana at the intersection of U.S. Highway 12 and Indiana 249. The primary work done in the area is the manufacturing of steel, and the port area is dominated by steel mills. The port is divided between the municipalities of Burns Harbor and Portage. West End is a neighborhood of the city of New Orleans. A subdistrict of the Lakeview District Area, its boundaries as defined by the City Planning Commission are: Lake Pontchartrain to the north, the New Basin Canal and Pontchartrain Boulevard to the east, Veterans Boulevard to the south, and the 17th Street Canal to the west. The area was largely built on land reclaimed from Lake Pontchartrain. It is a commercial seafood and recreational boating hub for the city and has been known for its seafood restaurants. In recent years, the area has seen large condominium-complex developments built which overlook the Lake, marinas, and centrally located 30-acre (120,000 m2) West End Park. The Tinley Moraine is a moraine around the Lake Michigan basin in North America. It was formed during the Wisconsin Glaciation and is younger than the higher and wider terminal moraine called the Valparaiso Moraine, which is located farther from the lake than the Tinley Moraine. Compared to the Valparaiso Moraine, the Tinley Moraine is much narrower and occupies a similar swath, about 6 miles (10 km) closer to Lake Michigan, and passes through the communities of Flossmoor, Western Springs, and Arlington Heights. The moraine probably was named after the village of Tinley Park, a village southwest of Chicago that lies on the moraine. The Indiana Harbor East Breakwater Light is an active aid to navigation that marks the end of a breakwater on the east side of the Indiana Harbor and Ship Canal where it enters Lake Michigan. City West was a village in Porter County, Indiana, USA, located on the shore of Lake Michigan approximately 10 miles west of Michigan City, Indiana. It was situated near the mouth of Fort Creek, now known as Dunes Creek, which empties into Lake Michigan near the Indiana Dunes State Park swimming beach. It was located near the former site of Petit Fort. Indiana City was a notional community in northern Lake County, Indiana, at the mouth of the Grand Calumet River. It was located in present-day Marquette Park in Miller Beach, near the southern tip of Lake Michigan. 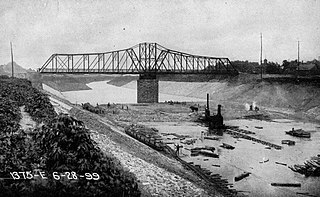 Indiana City was one of a handful of early contenders to be a port city on southern Lake Michigan, alongside Chicago, City West, and Michigan City. 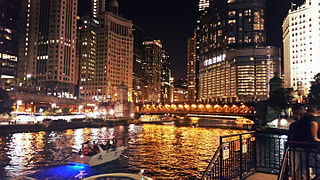 The Chicago Area Waterway System (CAWS) is a complex of natural and artificial waterways extending through much of the Chicago metropolitan area, covering approximately 87 miles altogether. It straddles the Chicago Portage and is the sole navigable inland link between the Great Lakes and the Mississippi River and makes up the northern end of the Illinois Waterway. The Grand Calumet River is a 13.0-mile-long (20.9 km) river that flows primarily into Lake Michigan. Originating in Miller Beach in Gary, it flows through the cities of Gary, East Chicago and Hammond, as well as Calumet City and Burnham on the Illinois side. The majority of the river's flow drains into Lake Michigan via the Indiana Harbor and Ship Canal, sending about 1,500 cubic feet (42 m3) per second of water into the lake. A smaller part of the flow, at the river's western end, enters the Calumet River and ultimately drains into the Illinois and ultimately the Mississippi River. Thomas J. O'Brien Lock & Dam is a lock on the Calumet River on the south side of Chicago. The dam is 326 river miles (525 km) from the Mississippi-Illinois confluence. The up-river side of the dam is at Lake Michigan's level, 577 feet (176 m) above sea level. The lock dimensions are 1,000 by 110 feet. The Manistee Harbor, South Breakwater is a navigational structure located at the mouth of the Manistee River, in Manistee, Michigan. It was listed on the National Register of Historic Places in 1995. The breakwater is significant due to its construction, which represents a final stage in the United States Army Corps of Engineers's use of timber crib substructures in pier and breakwater construction. The Chicago Maritime Museum is a maritime society and museum dedicated to the study and memorialization of Chicago's maritime traditions. The museum's webpage asserts that Lake Michigan and the Chicago River were key factors in Chicago's growth toward status as a world-class city, and pays tribute to Congress for granting lake frontage in 1818 to the infant state of Illinois. The museum opened in June 2016. ↑ "Project: Chicago Harbor Model Study - History". U.S. Army Corps of Engineers. Archived from the original on 2 March 2013. Retrieved 21 June 2016. ↑ "Slip Information". Chicago Harbors. Retrieved 14 June 2016. 1 2 "Harbors". Chicago Park District. Retrieved 14 June 2016.